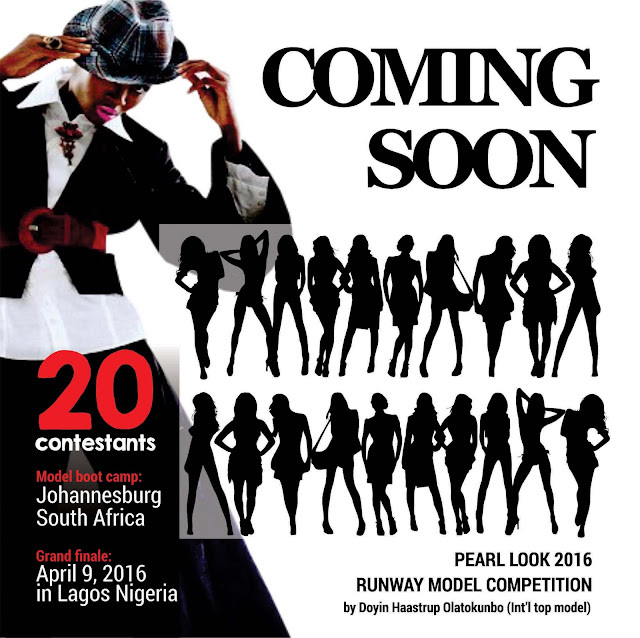 International model Doyin Haastrup Olatokunbo presents the Pearl Look 2016 Runway Model Competition. This is the 4th edition of the Pearl Look Models Competition which is as a fresh initiative born out from a burning desire to give back to the society by empowering young ladies. It’s a platform for young aspiring models to achieve their dreams. This event has been set up in such a way that each contestant participating in the competition will be trained and ready to face the challenges of modeling industry. After successful auditions in Benin City, Port Harcourt, Lagos and Enugu, 20 contestants were selected. The contestants will be travelling to Johannesburg in South Africa for the official bootcamp where they will undergo intense training on catwalk, poise and style. All the 20 contestants will return to Lagos Nigeria for the Grand finale coming up on the 9th of April 2016. Winner get International modeling contracts in Johannesburg, Milan and New York.